On Friday, February 1, Deputy Republican Leader Vincent Candelora (R-86) Hosted Boy Scouts Day at the Capitol in Hartford with State Representative Pat Boyd (D-50). 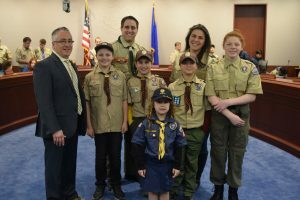 Deputy Republican Leader Vincent Candelora welcomes members of Troop 633 to the Legislative Office Building in Hartford on February 1 for a tour and inaugural ceremony to recognize girls being accepted into the Boys Scouts program in Connecticut. Scouts from all five of the Boy Scout councils visited the Capitol for a tour at 1 p.m. followed by an inaugural ceremony at 3:15 p.m. followed by a 2019 Report to the State and Meet and Greet. Nearly 150 Scouts, their leaders, parents, along with state and local officials from all over Connecticut were in attendance to celebrate girls becoming members of the new Boy Scouts program. Boy Scout Day at the Capitol celebrated the new Co-Educational Scouting program in Connecticut that welcomed its first girls into the Boy Scouts program. The girls at this unique Court of Honor Ceremony also received their Scout badge.